On February 2nd, VIDA, an organization in support of “Women in Literary Arts”, posted the above pie chart, along with about 50 others. 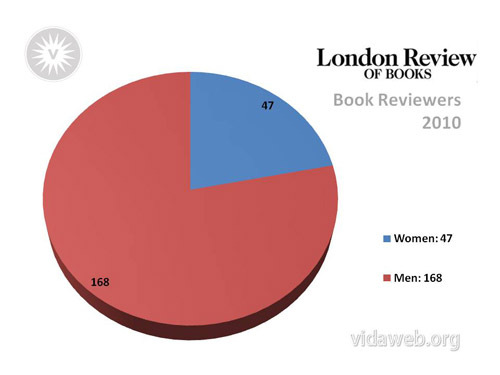 The charts tell a fascinating story about what appears to be a gender disparity when it comes to the books reviewed by reputable literary magazines. Across the board, of all the books reviewed in 2010, a startling number were written by men as compared to those written by women. What’s more, the reviewers themselves are, more likely than not, men. “We know women write. We know women read,” the article states. So why isn’t this represented? 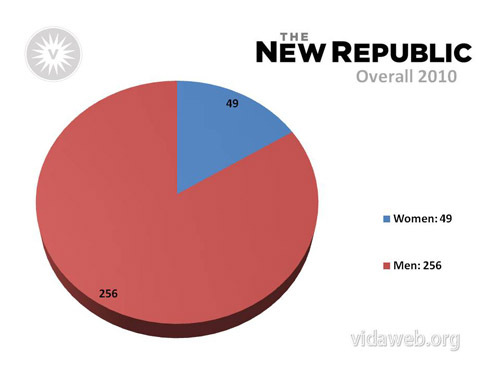 Five days after this appeared on VIDA’s website, The New Republic published an article written by Ruth Franklin, a senior editor there. It’s an article primarily in search of an answer, which does concede that the ratio holds true even for Ms. Franklin’s own work. It is no secret that most book reviewers are writers themselves and that more of them happen to be men is in keeping with the data produced by the survey. What Ms. Franklin does that is highly productive to this discussion (and it is somewhat strange that this wasn’t included in the original survey itself) is attempt to find out what the gender breakdown was in the books published in 2010, of which an inequitable amount were reviewed. So, along with Eliza Gray and Laura Stampler she surveyed 13 publishing houses along the spectrum. Lo and behold, it appears less books were published by women than by men and, in fact, the percentage of them reviewed was not too far from those published. Are there fewer women writers at present? Or are they just not being published? It is important to note, also, that the discussion here involves only those books which are worthy of being reviewed. Cookbooks, self-help books, self-published books and a host of other categories which make up the majority of all books in print are not included. We are talking only about literary fiction and non-fiction — that word which has, sadly, become an ambiguous one, at best. Curious, I decided to take a sampling of our own books at Portrait. To be perfectly honest, I began with an inkling that if any bookstore dealing in general literature (by no means Feminist) would beat the trend, it would be us. Our book buyer’s eye for literature and her intellect are nationally recognized and she is as discerning as she is sensitive to the rhythms and tones of culture. In short, she buys the best books out there. Out of 46o books counted, 152 were written by women. 308 were written by men. I was stunned by the number, but sadly unmoved by the truth it reinforced. I myself have read more books by men than by women. Why? Why is that? Surely, all the stock answers (most book publishers are men, literary magazines which publish shorter work where most writers are noticed and given book deals, are edited mostly by men, etc.) must reach their logical dead-end when it comes to a manuscript that is, simply, good. A good book is a good book. I find it hard to picture a publisher or even an intern (the gatekeepers of the future, those interns,) read an amazing manuscript and decide not to publish it because it was written by Jane and not John.